Currently 868 million people are undernourished and 195 million children under five years of age are stunted. At the same time, over 1 billion people are overweight and obese in both the developed and developing world. Diseases previously associated with affluence, such as cancer, diabetes and cardio-vascular disease, are on the rise. Food system-based approaches to addressing these problems that could enhance food availability and diet quality through local production and agricultural biodiversity often fall outside the traditional scope of nutrition, and have been under-researched. As a consequence, there remains insufficient evidence to support well-defined, scalable agricultural biodiversity interventions that can be linked to improvements in nutrition outcomes. Agricultural biodiversity is important for food and nutritional security, as a safeguard against hunger, a source of nutrients for improved dietary diversity and quality, and strengthening local food systems and environmental sustainability. 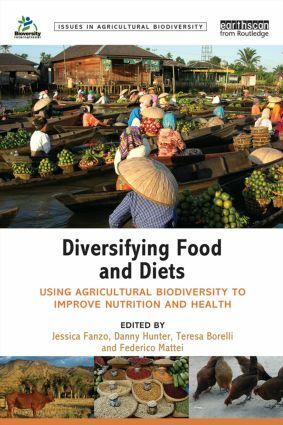 This book explores the current state of knowledge on the role of agricultural biodiversity in improving diets, nutrition and food security. Using examples and case studies from around the globe, the book explores current strategies for improving nutrition and diets and identifies key research and implementation gaps that need to be addressed to successfully promote the better use of agricultural biodiversity for rural and urban populations and societies in transition. Opening a can of mopane worms:can cross-sectoral partnerships leverage agricultural biodiversity for better quality diets?